1. International Agency for Research on Cancer. The GLOBOCAN project: cancer incidence and mortality worldwide in 2012. Available at: http://globocan.iarc.fr/ Pages/fact_sheets_population.aspx. 2. Злокачественные новообразования в России в 2014 году (заболеваемость и смертность). Под ред. А.Д. Каприна, В.В. Старинского, Г.В. Петровой. 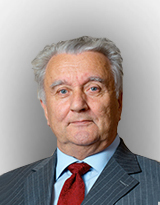 М., 2016. [Malignant tumors in Russia in 2014 (morbidity and fatality). Ed. by: А.D. Kaprin, V.V. Starinskiy, G.V. Petrova. Мoscow, 2016. (In Russ.)]. 3. Patard J.-J. Tyrosine kinase inhibitors in clinical practice: patient selection. Eur Urol Suppl 2008;7:601–9. 4. Motzer R.J., Hutson T.E., Tomczak P. et al. Sunitinib versus interferon alfa in metastatic renalcell carcinoma. N Engl J Med 2007;356:115–24. 5. Escudier B., Eisen T., Stadler W. et al. Sorafenib in advanced clear-cell renal-cell carcinoma. N Engl J Med 2007;356:125–34. 6. Hudes G., Carduc C.I. M., Tomczak P. et al. Temsirolimus, interferon alfa, or both for advanced renal-cell carcinoma. N Engl J Med 2007;356:2271–81. 7. Motzer R.J., Escudier B., Oudard S. et al. Efficacy of everolimus in advanced renal cell carcinoma: A double-blind, randomised, placebo-controlled phase III trial. Lancet 2008;372:449–56. DOI: 10.1016/S0140- 6736(08)61039-9. 8. Escudier B., Pluzanska A., Koralewski P. et al. AVOREN Trial investigators. Bevacizumab plus interferon alfa-2a for treatment of metastatic renal cell carcinoma: A randomised, double-blind phase III trial. Lancet 2007;370:2103–11. 9. National Comprehensive Cancer Network. NCCN clinical practice guidelines in oncology: kidney cancer. 2016. Available at: http://www.nccn.org/. 10. Ljungberg B., Bensalah K., Bex A. et al. Volpe Guidelines on renal cell cancer. European Association of Urology 2016. Available at: http://www.uroweb.org/. 11. Ravaud A. How to optimise treatment compliance in metastatic renal cell carcinoma with targeted agents. Ann Oncol 2009;20(Suppl 19): i7–12. DOI: 10.1093/ annonc/mdp073. 12. Motzer R.J., Rini B.I., Bukowski R.M. et al. Sunitinib in patients with metastatic renal cell carcinoma. JAMA 2006;295: 2516–24. 13. Motzer R.J., Hutson T.E., Tomczak P. et al. Overall survival and updated results for sunitinib compared with interferon alpha in patients with metastatic renal cell carcinoma. J Clin Oncol 2009;27:3584–90. DOI: 10.1200/JCO.2008.20.1293. 14. Motzer R.J., Hutson T.E., Olsen M.R. et al. Randomized phase II trial of sunitinib on an intermittent versus continuous dosing schedule as first-line therapy for advanced renal cell carcinoma. J Clin Oncol 2012;30:1371–7. DOI: 10.1200/ JCO.2011.36.4133. 15. Neri B., Vannini A., Brugia M. et al. Biweekly sunitinib regimen reduces toxicity and retains efficacy in metastatic renal cell carcinoma: A single-center experience with 31 patients. Int J Urol 2013;20(5):478–83. DOI: 10.1111/j.1442-2042.2012.03204.x. 16. Kondo T., Takagi T., Kobayashi H. et al. Superior tolerability of altered dosing schedule of sunitinib with 2-weeks-on and 1-week-off in patients with metastatic renal cell carcinoma – comparison to standard dosing schedule of 4-weeks-on and 2-weeks-off. Jpn J Clin Oncol 2014;44:270–7. DOI: 10.1093/jjco/hyt232. 17. Najjar Y.G., Mittal K., Elson P. et al. A 2 weeks on and 1 week off schedule of sunitinib is associated with decreased toxicity in metastatic renal cell carcinoma. Eur J Cancer 2014;50:1084–99. DOI: 10.1016/j.ejca.2014.01.025. 18. Atkinson B.J., Kalra S., Wang X. et al. Clinical Outcomes for Patients with Metastatic Renal Cell Carcinoma Treated with Alternative Sunitinib Schedules. J Urol 2014;191(3):611–8. DOI: 10.1016/ j.juro.2013.08.090. 19. Bracarda S., Iacovelli R. Sunitinib administered on 2/1 schedule in patients with metastatic renal cell carcinoma: the RAINBOW analysis. Ann Oncol 2015;26:2107–13. DOI: 10.1093/annonc/mdv315. 20. Houk B.E., Bello C.L., Poland B. et al. Relationship between exposure to sunitinib and efficacy and tolerability endpoints in patients with cancer: results of a pharmacokinetic pharmacodynamic meta-analysis. Cancer Chemother Pharmacol 2010;66:357–71. DOI: 10.1007/s00280-009-1170-y. 21. Abel E.J., Culp S.H., Tannir N.M. et al. Early primary tumor size reduction is an independent predictor of improved overall survival in metastatic renal cell carcinoma patients treated with sunitinib. Eur Urol 2011;60:1273–9. DOI: 10.1016/j.eururo.2011.07.008. 22. Molina A.M., Lin X., Korytowsky B. et al. Sunitinib objective response in metastatic renal cell carcinoma: Analysis of 1059 patients treated on clinical trials. Eur J Cancer 2014;50:351–8. DOI: 10.1016/j.ejca.2013.08.021. 23. Knox J.J., Barrios C.H., Kim T.M. et al. Final overall survival analysis for the RECORD-3 study of first-line everolimus followed by sunitinib versus first-line sunitinib followed by everolimus in metastatic RCC (mRCC). J Clin Oncol 2015;33(suppl; abstr 4554). DOI: 10.1200/JCO.2013.54.6911. 24. DavisI.D., Long A., Yip S. et al. EVERSUN: a phase 2 trial of alternating sunitinib and everolimus as first-line therapy for advanced renal cell carcinoma. Ann Oncol 2015;26(6):1118–23. DOI: 10.1093/annonc/mdv078. 26. Rini B.I., Quinn D.I., Baum M. et al. Hypertension among patients with renal cell carcinoma receiving axitinib or sorafenib: analysis from the randomized phase III AXIS trial. Target Oncol 2015;10(1):45–53. DOI: 10.1007/s11523-014-0307-z. 27. Escudier B., Michaelson M.D., Motzer R.J. et al. Axitinib versus sorafenib in advanced renal cell carcinoma: subanalyses by prior therapy from a randomized phase III trial. Br J Cancer 2014;110(12):2821–8. DOI: 10.1038/bjc.2014.244. 28. Rini B.I., Garrett M., Poland B. et al. Axitinib in metastatic renal cell carcinoma: results of a pharmacokinetic and pharmacodynamic analysis. J Clin Pharmacol 2013;53(5):491–504. DOI: 10.1002/jcph.73. 29. Rini B.I., Melichar B., Fishman M.N. et al. Axitinib dose titration: analyses of exposure, blood pressure and clinical response from a randomized phase II study in metastatic renal cell carcinoma. Ann Oncol 2015;26(7): 1372–7. DOI: 10.1093/annonc/mdv103.